The first BLT appearance of the Morning Musume。´17 13ki members! Nippon Budokan, 12 December 2016. Kaga Kaede and Yokoyama Reina. Will be making a new story from now on. A frank talk about the true feelings of of the two 13ki, just after they joined! It's your first appearance, so firstly, please tell us what led you to want to join Morning Musume。! Kaga: I've always liked them since I was small, but when I watched the MV to 'One Two Three', their dancing and singing were really cool. And then I took the 11ki audition. While I failed, I became a Kenshuusei. And after being a Kenshuusei for 4 years, I joined as a 13ki. Yokoyama: I've liked them since I was in primary school as well, but what got me started was watching the Morning Musume。 wake-up prank when I was in middle school. Despite having just woken up, they had smiles on their faces, their dancing was sharp, and I thought that it would definitely be fun to be in such a group. That legendary wake-up concert was your start! This isn't a prank. (laughs) By the way, what dreams did you have a long time ago? Kaga: I wanted to be a policewoman. The baton-wielding policewomen in front of the police station were cool, which led me to admire the police. Yokoyama: I think that it'd suit you! I can totally see you doing a salute, and your face is like a policewoman's! Yokoyama: I wanted to be a piano instructor. Yokoyama: I don't think that would happen though. Well, the two of you were destined to enter Morning Musume。´17! Well, please sell yourself to the people who still have yet to know the two of you. Kaga: My special skills are kendo and the trumpet, my hobbies are anime, games, and manga. In the group, we already have Kudo (Haruka)-san as the angelic as well as ikemen character, but I'd like to establish myself as a different kind of ikemen character. Yokoyama: I think that my most attractive feature is my smile, so I hope to someday go beyond the smile of the graduated Suzuki Kanon-san. Also, I really like funny stories, so I'd like to flourish doing things like MCs, where my role will be to liven up the group. Also, I love spring rolls, so I hope that spring roll lovers will also become my fans. (laughs) I like the spring rolls at Yokohama Chinatown, but convenience store spring rolls have gotten pretty yummy recently! Kaga: It's not that you like talking, but you like telling funny stories. You started off raising the bar pretty high though. (laughs) Will you be fine? Yokoyama: I'll be fine! Please leave it to me! 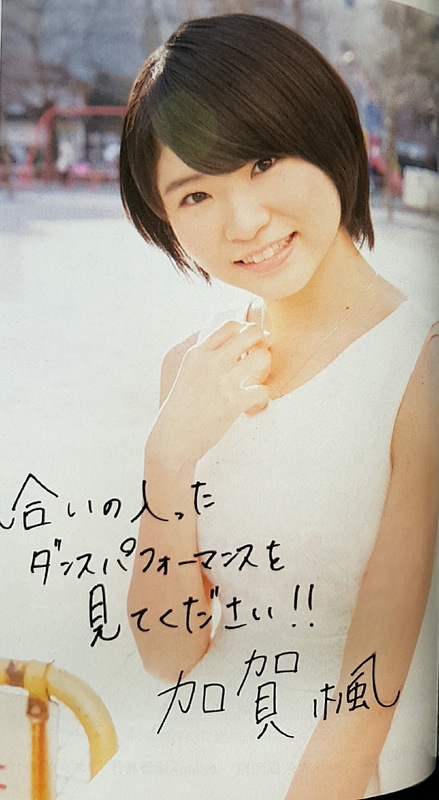 Kaga: I'd like to become someone who's the core of the group from the performance aspect, making use of the dancing that I've cultivated for four years as a Kenshuusei. In my Kenshuusei days, I ate too many of the chocolates that I'd been given by friends, so many that I put on weight. Now, I won't overeat again! The art is really pretty, and I'm a big fan of Aoi Yuuki-san, who plays the protagonist. It's currently the cool anime with a lot of expectations on it, so I really look forward to it. In middle school, I exchanged lots of chocolates with friends. I have memories of how difficult they were to make by hand. My whole family enjoys quiz shows, so we'll start having quiz showdowns while watching these shows. (laughs) I've actually learned a lot from the questions.